Probably the most famous tank of World War II, the Tiger I was originally conceived in 1941 in response to the German Army's experience in fighting British tanks and anti-tank guns in Western Europe and the North African desert. Following the invasion of Russia, the appearance of the Soviet T-34 and KW tanks lent a further impetus to the programme and 1,350 Tigers were produced between August 1942 and August 1944. The Tiger has proved to be one of the most popular modelling subjects of all time, with a vast and ever-increasing range of kits, aftermarket products and references available. 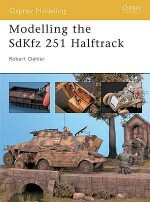 This title is a detailed modelling guide on the '121', s.Pz.Abt. 501, Tunisia 1943 in 1/35 scale. This guide forms part of Osprey Modelling 37 Modelling the Tiger I also available as an ebook.